It's all about the time I spend baking, cooking in my kitchen. I simply adore the combination of bananas and chocolates. When I was much much younger, whenever these two of my favourite food items were available, I would slice a banana into two, sandwich it with some chocolate bars, wrap it up nicely with foil and toast it in the oven toaster. Within minutes, I was able to indulge in one of the best dessert I could afford at that time. I made a Deeply Dark Devil's Food Cake from a recipe found in The Cake Book by Tish Boyle. I had initially planned to make a plain, fuss-free cake, but when I spotted the bananas dangling on the hook, I thought I should not miss the chance of creating my favourite combo. After the cake was cooled off, I made some chocolate ganache and layered it with banana slices. Since it was a last minute decision, I was totally clueless when I was about to frost the cake. I didn't want to fuss over the cake decoration, so I tried creating swirls with the back of a spoon. As the consistency of ganache was not right, I wasn't able to get the effect I had in mind. In the end, I simply made small little peaks all over the top of the cake...a rather shoddy job I must say, but it was the best I could managed at that time. The cake lived up to it's name...it was indeed a very dark and rich cake. One single slice was able to fill up my stomach the entire morning! With the chocolate frosting, I had to chill the cake in the fridge, as a result, it wasn't that moist and the texture became quite dense and fudgy, almost brownie-like. Position rack in the centre of the oven. Preheat oven to 325 degF. Line the bottom of an 8 inch cake pan with parchment paper, grease and dust the sides with flour. Sift together the flour, baking powder, baking soda, and salt in a medium bowl. Mix until well blended, set aside. With an electric mixer, beat the butter at medium speed until creamy, about 1 minute. Gradually add the sugar and beat on high speed for about 3 minutes until the mixture becomes pale and well blended. Add the cocoa powder and beat at medium speed for 1 minute. Scrape down the sides with a spatula when necessary. Beat in the egg, followed by the vanilla. At low speed, add the flour mixture in three additions alternating with the warm water in two additions. Scrape down the sides of the bowl and mix at low speed for 30 seconds. Pour batter into prepared pans and bake for 25-30 minutes until a skewer inserted into the centre comes out clean. Cool the cake in the pan for 20 minutes. Unmold cake and let cool completely before frosting. 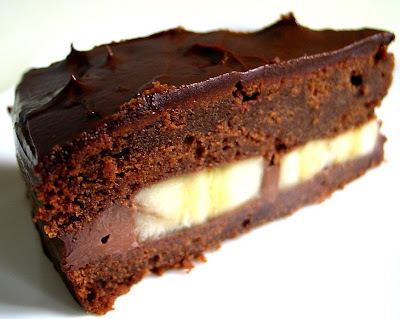 Brownie banana cake - yummmmmm! It sounds wonderful to me. Your story reminds me of the "banana boats" we would make as a family when we went camping. We would slice the banana down the middle and stuff them with marshmallows and chocolate bar, then wrap them like you say with foil, and put them in amongst the coals of the fire. When they came out, they were goey and delicious. We would scoop the dessert out with a spoon - yum! hmmmm yummy .. the chocolate cake looks so yummy. Anyway i think the little peaks looks very pretty. Just curious .. y is it that your list the baking powder and baking soda in such a way (ie 1/4 plus 1/8 tsp) ? Hi Sherlyn, I followed the exact way the original recipe is stated...guess the reason why is that, it will be difficult to measure a 3/8 tsp?! i have the same book HBB..but i haven't tried this recipe yet. it looks delicious though, lots of chocolate which i love. Your bakes look really really yummy! Anyway, I will be raising funds for my cca at the beginning of next year because we intend to set up a mini-scale scientific library (I’m from National Junior College by the way); so I was wondering if you’d be willing to sponsor some of your bakes for us to sell and raise funds so that the library can come to fruition (: Every little contribution will be greatly greatly appreciated! Looking forward to your reply! Eliza, you do have the book? I borrowed it from the library, I find it very informative, and I like many of the recipes...the bakes all look very simple, not fancy at all, and yet look so delicious! At last found someone in the food blogging community that is from where I was from - Hwa Chong JC. Nice to meet you via blogsphere! Your cake looks great. I would love to have a piece with a cup of coffee. Hi Florence, really? you were from HJC too?? I wont be surprised if you tell me you were from an all girl's secondary school?? I'm from Crescent Girls Sec School. hehe.. one of my fav breakfast is banana nutella toast! This cake looks really good and dense with chocolate- the way I like it! yum yum! 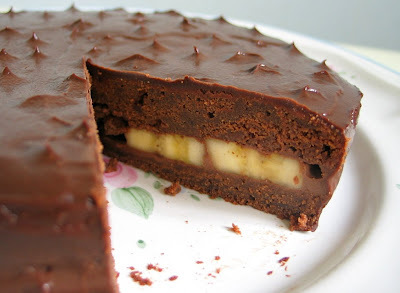 I absolutely love the chocolate banana combi :) Your cake looks amazing- i would kill for a slice of it. dear Pat, oh yes, this cake is pure indulgence! Daphne, I have been wanting to try banana and chocolate toast, wow, banan nutella toast sounds great too! yumm, yummy! the kind of chocolate cake I love! just curious, what camera are you using for taking all the photographs? thanks! Hi Lia, Thanks for your kind words! I am using a Canon Powershot G3 4.0 Mega Pixels. I don't know what you're talking about, that looks fantastic!! Hi Brilynn, you are so sweet!! Hi Robin, thanks for dropping by. Great to know your cake turned out well. I have the same book and tried to bake this cake last week. It turned out horrible, from the look, it look like kueh. don't know how to describe, I threw the whole cake away. I suspect maybe my water too hot. The book stated boiling water. Anyway, I enjoy reading your blog. I used boiling water too and it didn't give me any problem, maybe it could be due to other reasons? I do hope your next attempt will be a successful one :D and thanks for visiting! 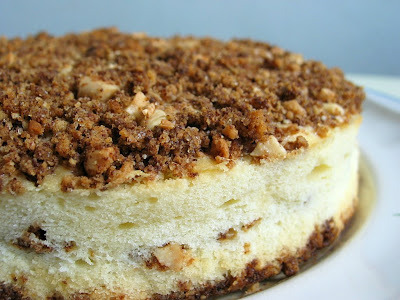 Hi, i'd like to give this cake a try =) Can I clarify what you meant with 'half recipe' for this? Also, how did you prepare the frosting? sorry this will be the first time i attempt a layered cake. Hi Oleagopoly, there were two ingredient lists provided for this recipe in the cookbook. I used the half recipe version which yields a smaller cake. As for the frosting, I melt dark chocolate with heavy cream. Place chocolate and cream in a bowl set over a pot of simmering. Stir the mixture till the chocolates are melted. Remove from heat and let cool before using. YIKES! This looks divine! 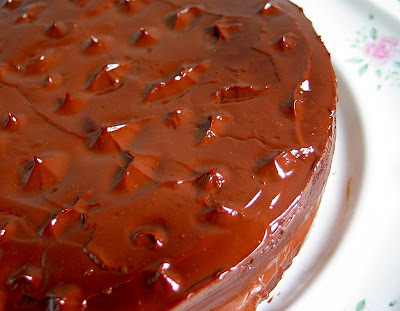 Chocolate cakes is our favorite in my house and I'm always looking for new ways to make it.. I love the really fudgy kind, and this looks like it will definitely be fudgy. YUM! Sorry to hear that your cake didn't turn out well, I think you should have to give a another try. Hi HHB, can i ask if you always use natural unsweetened cocoa powder for all your bakes? 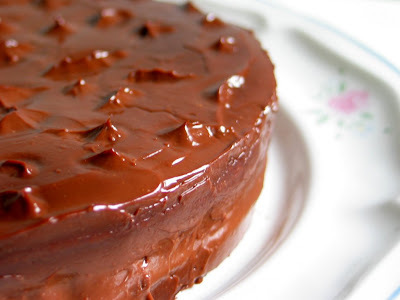 I want to bake some chocolate cake like this one and brownies. Not too sure abt the difference between natural unsweetened vs dutch processed. Wonder can i just get one type of cocoa powder instead of both. Thanks for taking time to clarify and explain. Now comes my new adventure to buy my first tub of cocoa powder. A stay-at-home mum with 2 lovely boys and a great hubby. When I am free, I like to play with flour, sugar, eggs and butter. This is a Flickr badge showing public photos and videos from happy homebaker. Make your own badge here. Phong Hong Bakes and Cooks! It’s the time of the year again! This work by Happy Home Baker is licensed under a Creative Commons Attribution-Noncommercial-No Derivative Works 3.0 Singapore License.